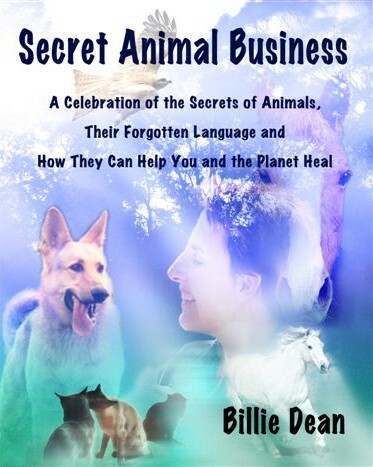 Secret Animal Business: A Celebration of the Secrets of Animals, Their Forgotten Language and How They Can Help You and the Planet Heal by Billie Dean. A book that changes lives. I am thrilled to have won Vegan of the Year 2013 in the Outstanding Author category for Secret Animal Business. Thank you to Vegans are Cool for this honour, and for calling SAB “a very important book”. Also available from Amazon.com and the Book Depository. 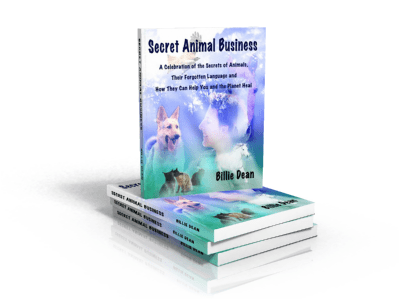 Secret Animal Business is a book that changes lives – the lives of the readers of the book as well as their animals. Drawn from my 30 years as a professional interspecies telepath, Secret Animal Business is the ultimate handbook of enlightened animal care, with everything from diet to education to how to communicate with them. But more, it is full of heart-warming stories from the perspective of the animals themselves, as well as a candid glimpse into what it is like to grow up as an ultrasensitive. I am a trained librarian – and I know good writing when I read it. I used to tell my young students when I was teaching, “If a book does not make you laugh or make you cry, or take you to places you have never been, then look for another book.” Your book Secret Animal Business is remarkable. So please, order your copy of Secret Animal Business by using the button on the side, and enjoy this mind-opening look at how you can improve your relationship with animals and nature. 388 pages. Softcover. “This is a book to touch the soul. So many books in today’s world are fodder for the brain, but luckily, this book is not. Secret Animal Business is a book for the heart. Whether we like it or not, know it or not, every author carries a signature energy. When I read a book, I am also reading the author; so as I read this book I read Billie Dean. And this is what most impressed me. I could feel a strong soul with a clarity and determination to shine a light into an arena that for a long time has remained a shadowed place. I have shone my light, and continue to do so, but each writer’s light is unique and different . . . and needed. Read this book with your heart as open as your eyes. If the mind begins any protest, tell it to be quiet, and keep on reading. Allow Billie Dean to inner-touch your life, offering you a new and exciting direction into Nature. Telepathy with all living things is simple . . . and as easy as our busy, complex minds will allow. Nature is waiting for you, offering a new life . . . be in it! Social visionary Billie Dean takes us on an incredible journey into the minds, hearts and spirits of the animals who share our lives. Her use of story paints a picture so illuminating that it leaves us wondering why we didn’t see this truth long ago. Secret Animal Business is wonderful, and provides us with insight into becoming a better person, not only for our animal friends but for humanity. I wish this book had been around when my first dog entered my life. Our time together would have been even richer than it was. I have long believed that animals and people needed more harmony, but Secret Animal Business takes this to a whole new level. Billie Dean spells out how enriching it can be to connect to nature, whether it is the cat on your sofa, the wombat outside, or the stones in your garden. – Patricia Hamilton, publisher, Conscious Living Magazine. 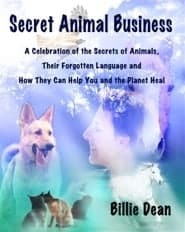 Secret Animal Business takes you on a journey that will surely open you more fully to the animal kingdom. Billie Dean writes not only from her generous heart, but from her soul’s wisdom. Secret Animal Business is a book whose time has come. Open your heart to Billie’s insightful wisdom, and you’ll come into a deep relationship of compassion, joy and understanding with all beings. Billie’s book is an absolute joy. It moved my soul. Her understanding of animals is pure magic and she shows us how the animals can teach us unconditional love. We are at a time of unprecedented change on our planet now and only unconditional love will work. Let us learn from our animal friends. Everyone should read this book.